(4:50 p.m. EDT) -- The first-ever details of Silversea's new Galapagos-based expedition ship, Silver Origin, were revealed at the 35th annual Seatrade cruise conference in Miami Beach. During the press conference, Silversea also further explained how its forthcoming Muse-class ship, Silver Moon, will differ from Silver Muse. Silver Origin, slated to launch in March 2020, is the first Silversea ship being built in collaboration with Royal Caribbean Cruises Ltd. through its new partnership. Public spaces will be designed in tandem by Miami-based architect Hirsch Bedner Associates and Italy-based design firm GEM, the team behind Silver Muse's interiors. 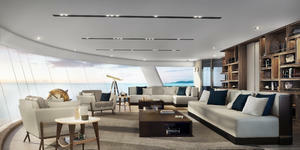 The spaces will boast a luxurious feel with elements of the islands' unique natural environment. The 100-passenger, all-suite ship will be purpose built to sail the Galapagos Islands and aim to bring cruisers as close to the destination as possible through its design, as well as culinary and enrichment offerings. Basecamp will be a social lounge and enrichment hub that will host educational lectures and other activities, many of which will incorporate the use of a large, interactive digital wall, where passengers also will be able to access destination content like videos, presentations and shore excursion previews. The lounge conveniently will be located next to the ship's Zodiac embarkation area; shore excursions will be led by members of Silversea's Expedition Team, who are certified by the National Park of the Galapagos. Meanwhile, Silver Origin's Explorer Lounge will host daily briefings and lectures from the ship's Expedition Team. The venue will feature a large video wall and HD screens to elevate the enrichment experience. Nestled at the front of the ship, the Observation Lounge will provide a space to unwind, with walls of windows letting in the surrounding views. 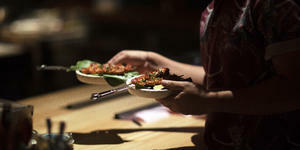 Another way Silver Origin will bring Ecuadorian culture onboard is through authentic cuisine prepared by local chefs. Silver Origin, like other Silversea ships, will be all-inclusive, with alcoholic beverages, food and other perks covered by cruise fares. The ship's two dining venues -- The Restaurant and The Grill -- will be able to accommodate all passengers at full capacity. The Restaurant will be a relaxed space with lots of natural light, while The Grill will be a more sophisticated venue offering Silversea's signature Hot Rocks dining experience. 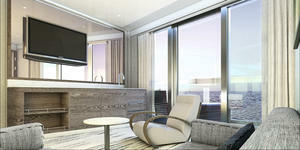 Out of Silver Origin's 51 suites, cruisers can choose from eight categories. Although specific category details have yet to be revealed, all suites will offer balconies. Some will be Horizon Balconies, which easily convert into closed spaces with a floor-to-ceiling windows; others will include ocean-view bathtubs and ocean-view showers accessible from the balconies. The ship will have a nearly 1:1 crew-to-passenger ratio. In addition to destination-inspired interiors and programming, Silver Origin will feature a waste water treatment system, energy efficient technology and an environmentally friendly design with a positioning system that will allow the ship to automatically maintain position to protect the ocean floor. Water purification systems also will be installed in each suite to reduce the consumption of single-use plastics. 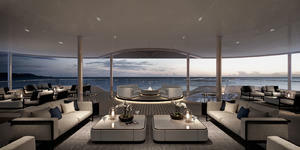 "Silver Origin will elevate our industry-leading offering in the Galapagos Islands, unlocking meaningful experiences for guests as they travel in ultimate luxury," said the line's CEO, Roberto Martinoli. "Ever since the early planning phases, every decision on Silver Origin has been made to strengthen the connection between our guests and this spectacular, unique destination." Bookings for Silver Origin will open on May 29, 2019. The ship will depart for its first revenue sailing on June 27, 2020. In other news, Silversea said it plans to significantly alter the layout of Silver Moon -- moving and extending restaurants, bars and other venues, compared to where they are located on Silver Muse. The biggest change will be the relocation and expansion of La Dame, the ship's high-end restaurant. On Silver Moon, it will move from Deck 4 to Deck 8 and be expanded to include seating for 64 (up from 40). It also will include both an indoor and outdoor dining space. 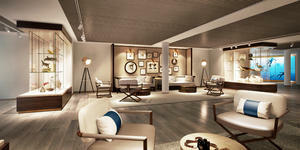 As previously reported by Cruise Critic during a sampling of Silversea's new S.A.L.T. (Sea And Land Taste) program, Silver Moon will be outfitted with a S.A.L.T. Kitchen and central S.A.L.T. Bar, both of which will replace the space occupied by the Indochine restaurant on Silver Muse. (Indochine will not appear on Silver Moon.) Additionally, a S.A.L.T. Lab will move to La Dame's former location. The venues will debut onboard Silver Moon when it launches in August 2020. Menus at the S.A.L.T. Kitchen and Bar will rotate, depending on the region in which Silver Moon is sailing. Meanwhile, the S.A.L.T. Lab will be a culinary enrichment space that hosts educational demos, workshops and tastings. Silversea said during the press conference it plans to continue a similar layout on future ships, including Silver Dawn and others that are part of the Silver Evolution project but still would not confirm whether the S.A.L.T. venues and programming would be added.